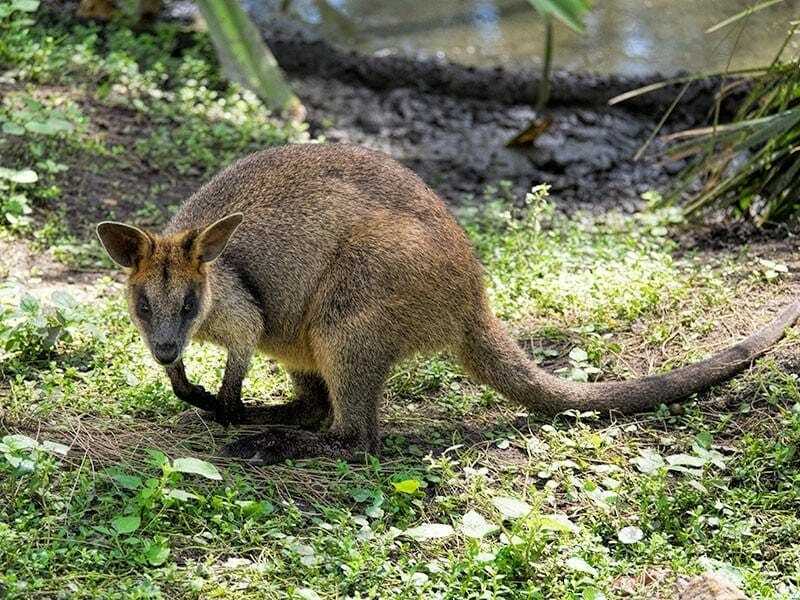 Fleays Wildlife Park is conveniently located in Currumbin on Queenslands Gold Coast. It offers a chance to get up close and learn about many of Australia's native animals in a casual and relaxed family atmosphere. Last weekend we wanted to get out for some fresh air and to try out the new camera gear. We’d been meaning to get back to Fleays Wildlife Park for ages but were a bit shocked when we worked out it was probably 10 years since we were last there. It’s a gorgeous location with it’s sanctuary and natural creek habitat. It’s close to some lovely Gold Coast beaches and not far from the Burleigh Heads national park, a gorgeous walkway that takes in the white sand surf beach, rock foreshore and the calm beaches of the estuary. 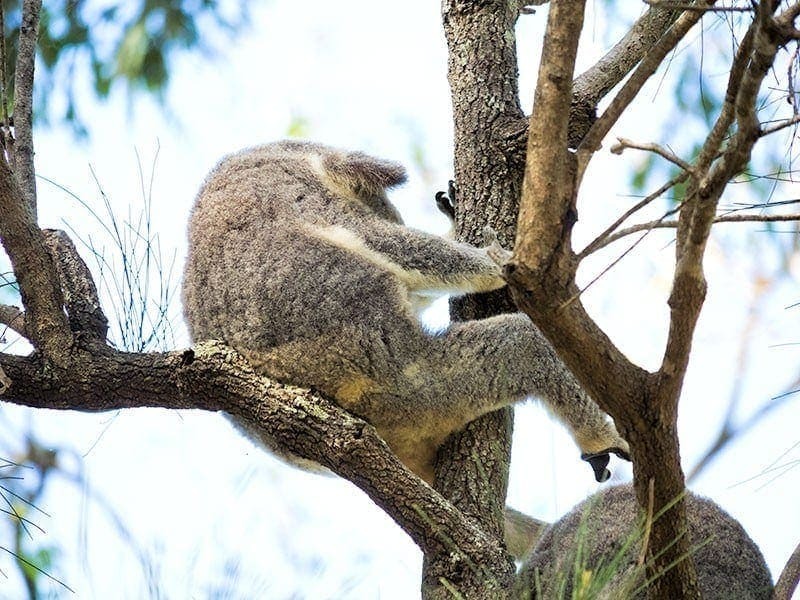 Fleays is a bit different to other local wildlife experiences such as Currumbin Wildlife Park and Australia Zoo. While they all allow you to get up close and learn about Australia’s unique wildlife and provide a native animal hospital facility their purpose is different. Fleays from it’s origin has been a sanctuary maintained for scientific research and education and is owned and managed by Queensland Parks and Wildlife Service. This difference in origin and purpose is reflected in the style of the parks. 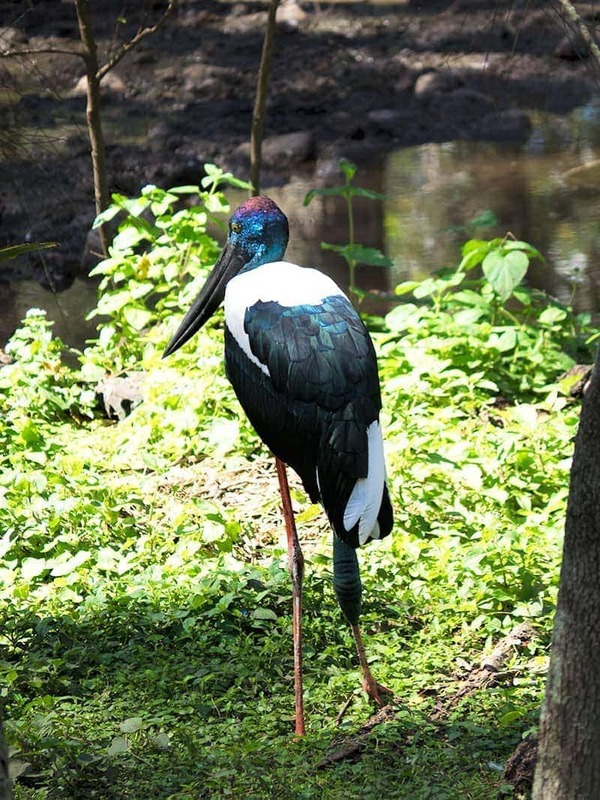 Fleays Wildlife Park is more rustic but the animal enclosures are spacious and the facilities like toilets, cafe and picnic zones are well maintained. Don’t expect to find adventure playgrounds, exotic animals, segways or big shows here. It’s also physically smaller and there are less animals, both in variety and total number. Having said that I’ve really enjoyed our visits to all three parks for different reasons. In deciding which to visit it’s worth understanding what each offers and to match that to what you’re looking to get out of that trip. 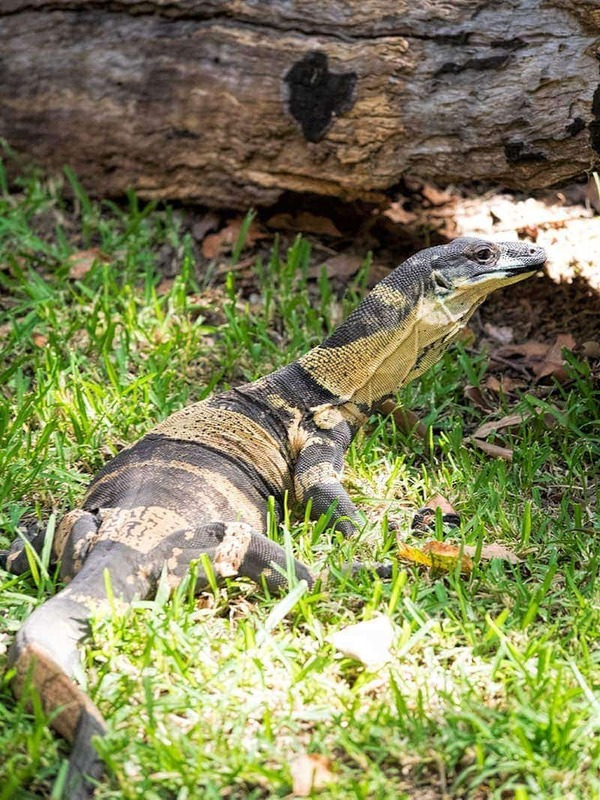 It’s fair to say that Fleays Wildlife Park blends more with the natural diversity of the Gold Coast rain forests to it’s west than it does with the glitz of the Gold Coast strip to the east. The park is nicely set out in a big loop with a few offshoots. The central enclosures are very large and naturalised allowing the animals to mix and take cover during the heat of the day. I actually enjoy having to search for the animals rather than them being presented in a smaller space. The boardwalks are elevated giving a good view to most of the enclosures but there are a few that are viewed through older style tall wire fences. Many of the enclosures are mixed helping with the naturalised feel of the park. 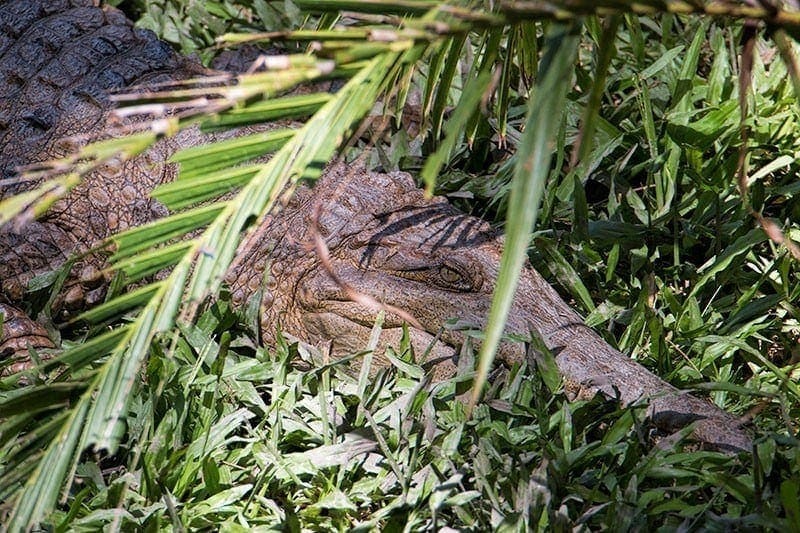 In one of the first enclosures we passed there were swamp wallabies, brolga, black necked storks, a variety of other birds that had flown in and at least one crocodile which were all easily viewed from the walkway. Fleays team are big on education of the community. They’re great with children asking questions during the presentations and run a well regarded childrens’ experience programme. 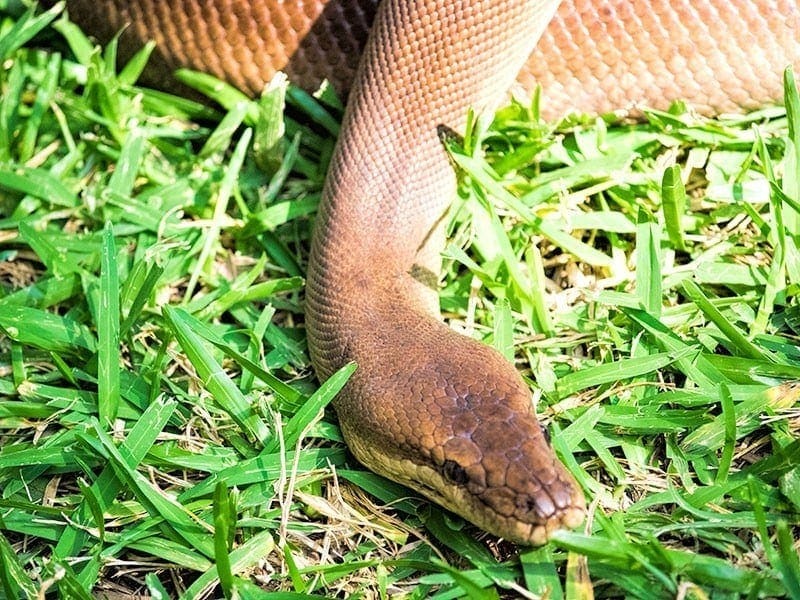 This Olive Pyton was a favourite with the kids who couldn’t wait to pat it, he’s a rescued pet from someone who wasn’t keeping him in a safe environment and he got badly burned so he can’t go back to the wild, Fleays Wildlife Park has been his home from several years now and while Olive Pythons don’t naturally venture as far south as the Gold Coast and he seems more than happy with his new home. He has the best nature putting up with us all standing around and touching him for ages. 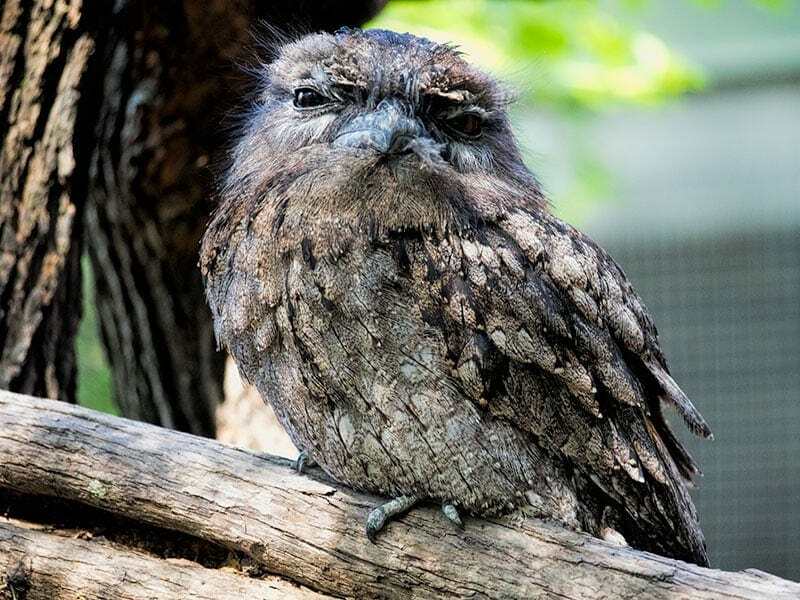 Some of the rescued animals at Fleays will only stay at the wildlife park long enough to heal, others such as this adorable Tawny Frogmouth are free to come and go but have chosen to become permanent residents. He was hit by a car whose driver rushed him to Fleays but sadly he only has sight in one eye now so wouldn’t survive well as a nocturnal hunter in the wild. He seemed happy enough with the grubs handed out by his keeper instead and while his enclosure was completely open he wasn’t interested in going anywhere. In his lifetime David Fleay did so much for wildlife conservation achieving worldwide recognition. He helped shaped the way for modern animal sanctuaries and achieved incredible success with captive breeding of many species. One of his most noted achievements in 1943 was successfully breeding a platypus in captivity, something that wasn’t achieved again for another 55 years. He also had outstanding success with breeding programmes for Australian birds of prey including powerful owls and wedgetail eagles and after 60 years of trying successfully bred the first yellow-bellied glider in captivity. He moved from Victoria in late 1951 and selected the site on Queenslands Tallebudgera Creek as the location for his reserve. He choose the site because it was flood and frost free and was a habitat with koala, fish, birds and mammals already in situ. He was very clear from the start that his place was a sanctuary for scientific research and education, not a zoo. In an attempt to ensure the continuity of his sanctuary beyond his lifetime he transferred the park to the Queensland government in the early 1980’s but continued to live and work there until his death in 1993. The park is now managed by the environmental protection agency with heavy reliance on volunteers. 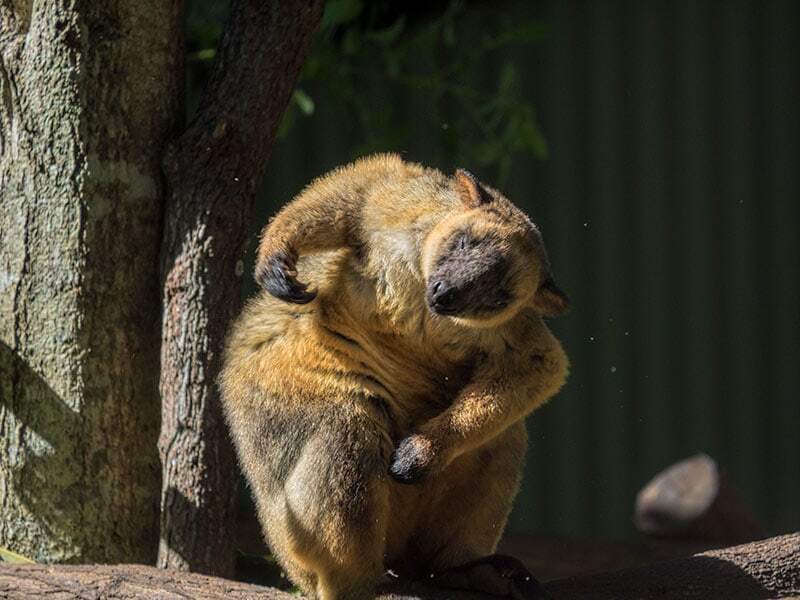 The breeding programmes have continued but unfortunately this rare female Lumholtz tree kangaroo is now on her own in her enclosure, she did give birth successfully in captivity but the infant didn’t survive and her mate has since also passed away. Of the 63.5 acres passed to Queensland Government by David Fleay only 7.5 acres were gazetted in 1995, 2 years after his death, as David Fleay Wildlife Park. The original precinct is now completely off limits to the public, an unfortunate downside of the bureaucracy of a government agency who deemed the paths too uneven making them unsafe for the public. We felt entry to the park was well worth the normal $20 entry fee but when we went there was a school holiday promotion on and adults only paid childrens prices (half price). I’ve heard this advertised before so it might be a regular holiday promotion. Despite the deal being on and it being a weekend it was still fairly quiet, it didn’t feel crowded anywhere in the park. There’s plenty of car parking on site, alternatively if you are staying on the Gold Coast catch the Surfside 756 bus stops that stops just 300 meters down the road. There’s now a cafe on site which helps with funding and builds on the tea and sweets that Sigred Fleay used to serve to visitors on the veranda of her home. The park is wheelchair and pushchair friendly to a degree. There are ramps making all areas accessible but there is a bit of uphill and the paths are narrower than you’d find in a the major tourist wildlife parks. Did we enjoy Fleays Wildlife Park? Fleays Wildlife Park is definitely worth a visit if you like something a little less commercial, not crowded and want to spend some quality time around the animals. The talks by the staff were excellent and I’d definitely recommend getting along to those. The staff generally were extremely knowledgeable and approachable, they real do seem to care a lot about their animals. If I had overseas visitors to Australia and we were only going to get to one wildlife attraction I’d probably still take them Currumbin Wildlife Park because of the number and variety of animals, the opportunity for them to hand feed the animals in the wallaby and kangaroo enclosure and the modern style enclosures that make it very easy to see almost all of the animals without looking through wire fencing. Fleays would be a good alternative though for anyone who enjoyed a quieter more naturalised environment. Having said that it was my second visit to Fleays and I won’t leave it so long to go back next time. It would also be my choice if I wanted to go somewhere on the weekend or school holidays without the crowds. The balcony off the cafe did look inviting but we’d got a picnic which we took into the park, they had good clean tables and facilities nestled into spots all around the park to choose from. If you have a bit more time the boardwalk at the front of Fleays Wildlife Park is the start of the Tallebudgera Conservation Park Walkway that joins it to the Burleigh Heads National Park. It’s well worth checking out, we were so lucky to see a wild koala along here that climbed down and crossed the path in front of us, much closer than even in the sanctuary. Please do leave a comment below if you’ve visited Fleays Wildlife Park or any of the Queensland wildlife sanctuaries. Which was your favourite? I’m usually disappointed with the variety of animals you actually see in parks and nature trips but Fleays goes against the grain here. It sounds like a laid back kind of place to visit. As you say all 3 are great in their own ways. Seeing Australian wildlife would be an absolute dream come true for me!! And what could be better than visiting a sanctuary – despite I am actually working in the Helsinki Zoo in Finland, I still find the existence of zoos morally questionable. Therefore, I’d always go for a sanctuary rather than a zoo. Great post! Nice shots! I captured one of a Tawny Frogmouth too in Featherdale in Sydney and it was looking directly at the camera. What new camera gear, by the way? That owl looked so cute! I’m glad that the animals are being so well cared for and that visitors have an opportunity to learn so much. Withe the exception of the scaly ones, all animals are so cute 🙂 What’s the name of the one in the first photo? 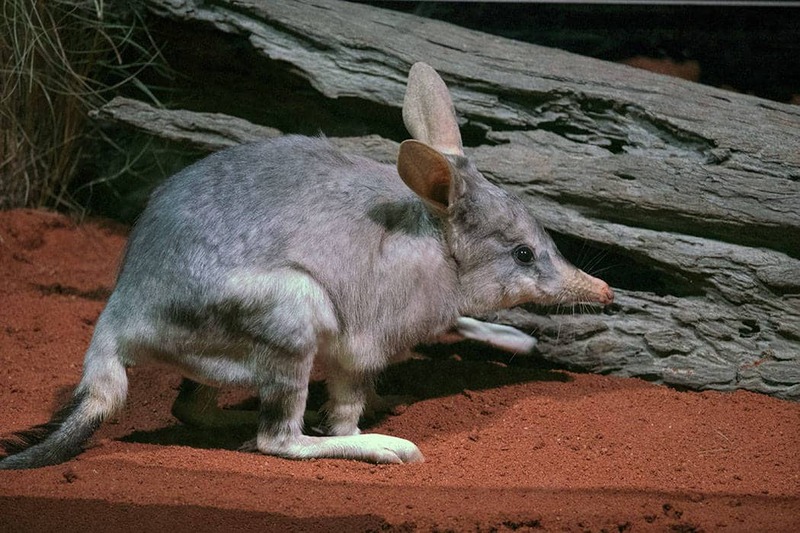 Hi Ana, the first animal is the Greater Bilby (although the lesser is now extinct) and these are endangered – hopefully the conservation programmes succeed, they are very cute little animals. I would love to visit. The camera gear seem to be working really good. Clean photos. I have yet to make it to Australia. Fleays Wildlife Park looks interesting. Not sure if it would be on the itinerary for a first-timer but surely worth the thinking about. Interesting history about David Fleays’ efforts in conservation. I’m usually disappointed with the variety of animals you actually see in parks and nature trips but Fleays goes against the grain here. I love koalas! What a wonderful legacy for David Fleay to allow his life’s work to live on. We really enjoyed our introduction to Australia’s wildlife when we visited Queensland and the NT. This looks like a terrific experience. We went only 2 months ago on the way home from a holiday in Northern NSW. Like you, it had probably been 10 years for us too, but worth the visit.